According to tweets and local blogs, witnesses are reporting burned people on the ground. The images—captured by witnesses in the area using cellphones—show some dead bodies on the ground. The airplane was an old McDonnell Douglas MD-83 with about 152 people on board, including passengers and crew. The MD-83—aka DC-9-83—started to fly in 1984, finishing production in 1999. It could carry 155 passengers while keeping a range of 2,504 nautical miles (2,881 miles, 4,636 kilometers). There are no official casualty figures yet, according to Lagos emergency manager Femi Oke-Osanyinpolu, but it could be pretty high if you add the passengers to the people on the ground. Firefighters—two firetrucks—and emergency medical teams, including 50 rescue people, are already in the area trying to rescue potential survivors from the plane and on the ground. An AP reporter says that there are seats scattered across the area. It seems the apartment building crumbled as the firefighters were trying to put down the fiery flames and thousands of people looked from a distance. The fire is pretty bad, as the airplane had just taken off from Lagos' airport and it was full of fuel. It was en route to the Nnamdi Azikiwe International Airport in Abuja, Nigeria's capital in the center of the country. Like Brasília in Brazil, Abuja is a planned city built to hold the country's administrative center from scratch. It became the official capital of the country in 1991, after construction begun in the 1980s. Lagos is still the largest city in Nigeria. There's no official cause for the crash yet, although witnesses say the plane hit a power line. If that's true, it must have been on its way down, since the runway is not close enough to that part of the town. The weather conditions were good and visibility was 10+ kilometers (more than 6.2 miles). 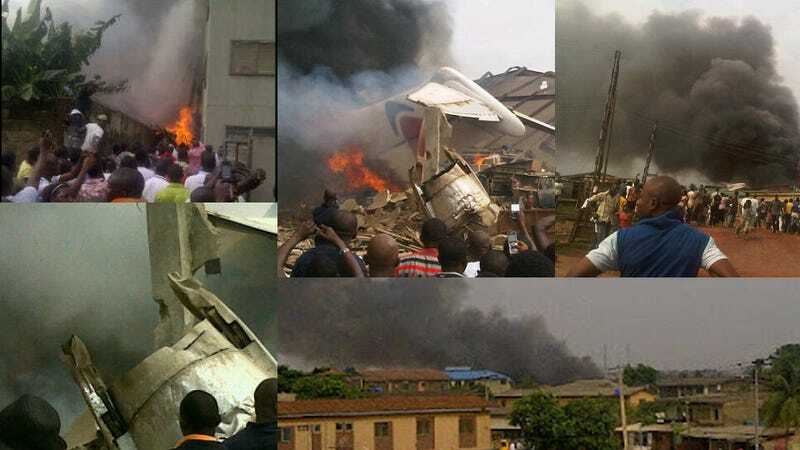 Update: Nigeria's aviation authority has officially confirmed that there are no survivors. 159 people were in the plane, including crew. The pilot communicated the emergency one minute before disappearing from air control's radar screens.